Little did I know when I stitched the first dress for my favorite doll, that sewing would be a lifelong pursuit. That simple cotton dress was made under the watchful eye of our neighbor, Mrs. F., using pattern pieces cut from paper lunch bags with fabric from her remnants drawer. Baby doll clothes to Barbie, I tried them all. Soon, I graduated to making simple garments for myself, and at age 14 chose to sew a dress for my confirmation. Mrs. F guided me along as I chose a lovely textured white pique, and in the style of the 70’s this dress featured bishop sleeves, wide cuffs and was several inches above the knee. Mrs. F. was a stickler for precision, and I learned how to “correctly” sew on a button, make buttonholes, and hand sew the button loops that closed those wide cuffs. I was hooked! In high school, I saved my tips from waitressing and bought my first sewing machine, a Kenmore from Sears. I sewed most all of my clothes then, and distinctly remember the Christmas of my Senior year. I explained to my parents that I really didn’t want any gifts, just money to buy fabric. We lived in a small, 3 bedroom bungalow, and my parents never complained as I sewed on the dining room table night after night…although I did get quite an earful from my Dad when I made a backless, fire-engine red satin halter dress for Homecoming that year! I stepped away from the sewing machine during my college years…..but found my way back when I made my first quilt the first year of my married life. I joined a quilt group, building long-standing friendships. I resumed garment sewing, mostly slacks and tops for work. As our family began to grow, making clothes for our four children took me back in a way to those doll clothes made so many years before. I love to go back through the old photos and see the kids dressed in the outfits I made, even the one of my oldest daughter and I in matching outfits: she’s in a cute little romper, and I’m in a tent-like maternity top! I’ve made many a prom dress, repaired lots of sports uniforms and sewed numerous raffle quilts as the kids traveled through their high school years. Today, my sewing is an even more enjoyable part of my life as I have more time to spend on it. repairs for the boys, even though they are all in their 20’s now. And I make sure that my husband isn’t neglected: wall hangings for his office and quilts for our bed. Teaching myself over the years to make pattern adjustments have resulted in clothes that I have sewn for myself that I find fit this middle-aged body SO much better than anything I can find in ready-to-wear. I no longer sew on the dining room table but have a large, well-lit dedicated sewing space. The Kenmore machine has been replace by a Bernina, and I use the serger and the embroidery machine as the project dictates. I’ve traveled to Chicago and New York City to purchase fabrics and shop both locally and online. I take a class here and there, and have been enriched by the very friendly and gracious online sewing community. Sewing has become more of a lifestyle than a hobby for me, and I’ve enjoyed every minute of those 40+ years . 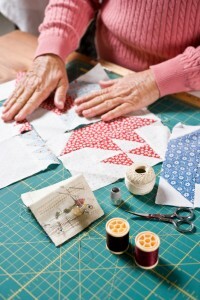 Here’s to sewing in September……..National Sewing Month!